It’s not just individuals that use transit, there are entire families that hop aboard the bus, train, or ferry to get from A to B. For the month of February, we’d like to share some stories with you about families and public transit. Every day moms, dads, sisters, brothers, sons, and daughters board PSTA buses to make their way around the county. Many of these family members travel together, and some families turn it into an adventure. Not long ago I found myself in a situation where telecommuting for work was no longer an option. This happened right at the same time that I was purchasing a house in St. Petersburg. I suddenly found myself travelling to Manatee County five days a week – too much for me. 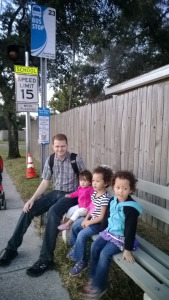 So, last year I started a new job in downtown St. Pete – and what a commute I have now!